5. ESD Testing - IAC's static-dissipative worksurfaces, shelves, and ground bolts undergo testing at the factory. Resistance is measured based on a variety of relative humidity settings. As a robot, I'm very good at taking tests. I actually get tested every 3,000 miles…or is that when I get my oil changed? 4. Optional Personnel Grounding Wrist Straps and Ground Blocks - The Personal Grounding Kit includes a Grounding Block, (which connects to the Grounding Lug on the worksurface), a Wrist Strap, and a Ground Cord. I was built ESD safe, so I don't need a Grounding Kit. But I do wear Wrist Straps as a fashion accessory. 3. Stainless Steel ESD Grounding Lugs - These are built right into the worksurface and provide an easy connection to a grounding system. That's funny, my ex-girlfriend used to call me a "stainless steel lug." 2. Static-Dissipative Laminates - IAC uses two types (3M and Nevamar®) of static-dissipative laminates on their worksurfaces and shelves. Oh, these are extremely comfortable, too. I use them as blankets. 1. Rounded Edges on Worksurfaces - IAC's premium and industrial workbenches include a 180°-rolled front edge, which protects the ESD-safe laminate from chipping, lifting, and other damage. Speaking as someone who has many rounded edges I can tell you this is really important. Thanks, Q-Bot! Well, there you have it, our Top Five Ways IAC Industrial Workbenches Help You Avoid ESD. QSource.com offers a fine selection of IAC ESD workbenches, workstations, and more. 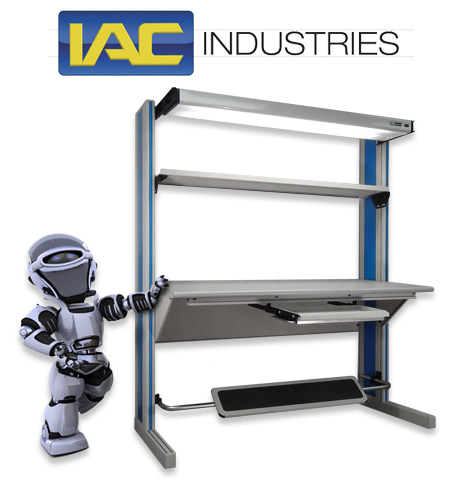 To make your choice easier, we've created the "IAC Workbench/Workstation Configurators page," which will help you narrow down your options to find you the perfect IAC solution for your application. For further information, or to place an order, please contact us via phone (800-966-6020) or email and one of our helpful sales associates will assist you. You're kidding!? Have you really waited this long to visit our Facebook Welcome tab and "like" us? Haven't you heard about our June Social Networking Sale where you can save 10% off EVERYTHING on QSource.com? There are only two days left to take advantage of this awesome offer. That means in just 48 hours you won't be able to save an additional 10% off items from our Clearance Center, Featured Products Department, or from any of the 70+ manufacturers that we feature on our site. That Brady BMP®51 Portable Label Printer sounds even better with 10% off, doesn't it? And how about a pair of those quality Lindstrom Rx Series Cutters with even more money saved? An extra 10% off makes for a great time to stock up and save. As we said, there are only two days left before this chance to save expires. Do you really want to miss out? Of course not, so here's what you need to do: Visit the Welcome tab of our Facebook page, and if you haven't already, "like" us. After that you'll receive the code to get the 10% OFF for the June offer and be all set to access future special offers. So, sign up, sign on, and save! For those soldering projects that need portability or an extra-long reach, we'd like to tell you about the Hakko FX-601 Adjustable Temperature Control Soldering Iron. This hand-held soldering iron is perfect for hobbyists (especially for stained glass artists) or for mobile applications where using a full-size station would be difficult. 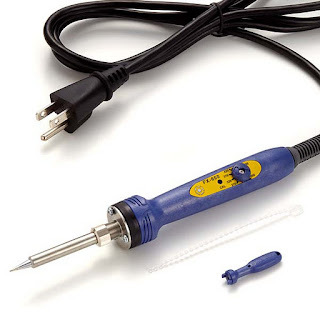 The Hakko FX-601 Adjustable Temperature Control Soldering Iron is very simple to use. The user can easily adjust the temperature with the control knob. The built-in temperature controller works fast and when the selected temperature is attained an LED on the grip blinks to let the user know. The FX-601 soldering iron also features adjustable "electronic" closed-loop temperature control. The iron allows the temperature to be set via a dial on the handpiece. But for process control engineers or supervisors, there is a temperature adjustment tool included with which the temperature can be set and then locked. This will protect against unwanted temperature changes by the operator, which could potentially damage sensitive components. For more info about the FX-601 soldering iron, you can read QSource.com's "Hakko Soldering Iron Comparison" TechCenter article. To place an order, or get more specs, visit the FX-601 page at QSource.com, where we also offer an extensive line of Hakko soldering stations, soldering tips, and accessories. If you have further questions, please give us a call (800-966-6020) or send us an email and one of our experts will be glad to help you. 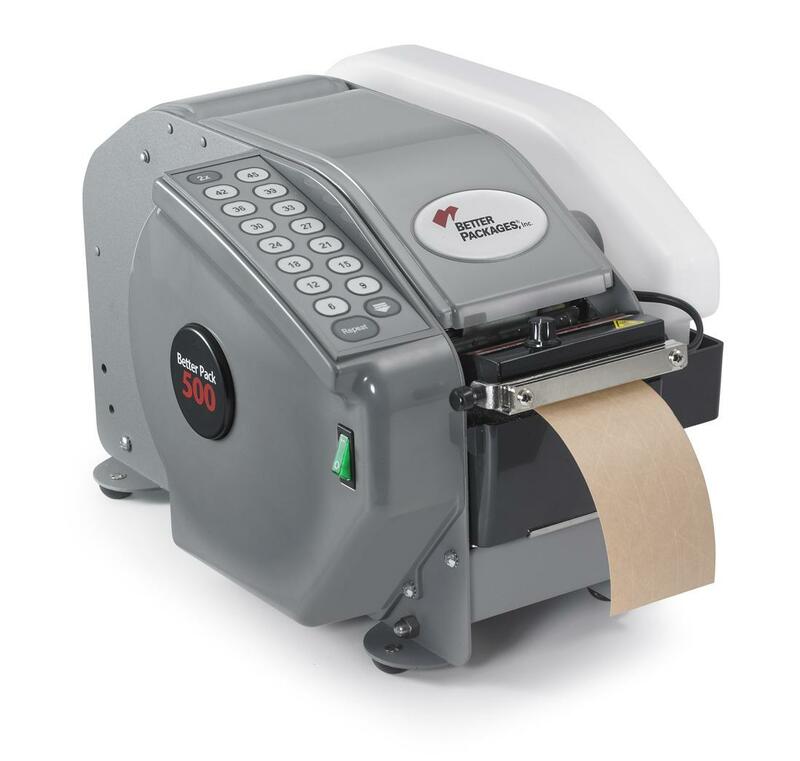 A FREE Brady BMP®21 Hand-held Label Printer when you buy two? Fifty-percent off a BMP®71 Portable Label Printer when you buy one? Brady's Summer Printer Promo is going strong, and believe us when we say that this one is can't miss! We're excited to be able to tell you about these incredible offers: From now until July 31, 2012, you can get great savings on two of the most popular, quality Brady printers. With sales like these, now is the best time to upgrade your existing portable label printers or to experience the rugged, versatility of Brady's printing solutions for the first time. 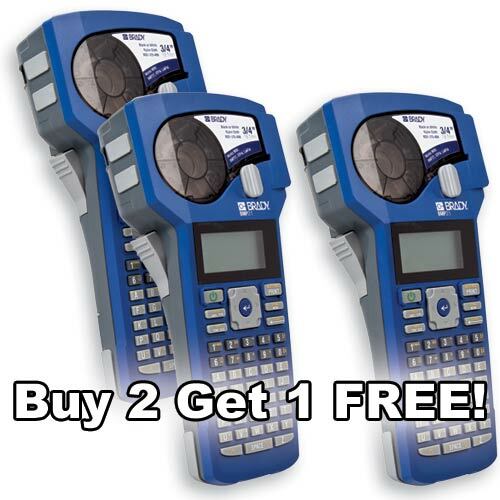 Brady's "Buy 2, Get 1 Free" special offer (Brady #: BMP21-3-PACK, Q Source #: B001-005235), features the fast, easy-to-use BMP21 Label Printer. Great for use in a variety of environments and applications, the BMP21 can create clear, long-lasting labels that stay stuck for years. 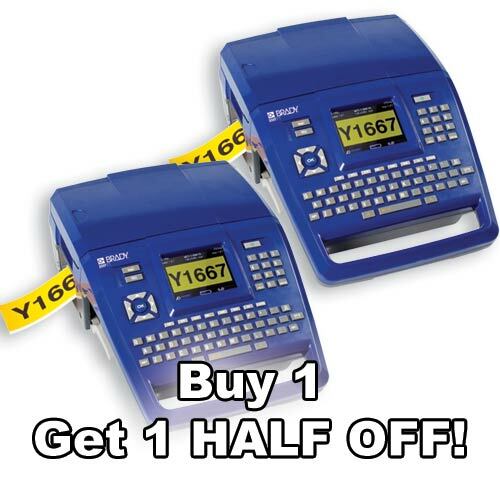 Taking advantage of Brady's Buy 1, Get a Second for 50% Off offer (Brady #: BMP71-2-PACK, Q Source: B001-005236), is a great way to build a feature-packed system of BMP71 Portable Label Printers. Boasting a large selection of label materials and design options, this quick, efficient printer can do it all. If you'd like to learn more details about these offers, or about other specific Brady products, please email us or give us a call (800-966-6020) and we'll make sure you get all the answers you need to make an educated purchase and select the right printer for the job. Please note: When ordering these items, the specific offer codes must be used to get the special offer (e.g., BMP71-2-PACK or B001-005236 for the BMP71 50% off offer). Excelta's 5-Star Cobaltima® Series Tweezers are for the most critical applications. They offer ultra-precision and are made with the most advanced materials available. LaFrance also explained why the Cobaltima 5-Star Tweezers are very necessary in today's high-precision assembly environments. QSource.com's offers a full line of these high-quality tweezers at impressive low prices. 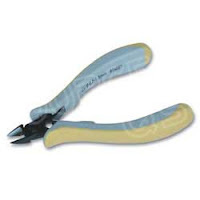 Watch our video, visit our site, and then purchase the "precisely right" tweezers for your job. Keep watching for more "On the Bench" videos on QSource.com and on our YouTube channel. When choosing the proper cutters or pliers for the job there are a few factors to consider, including: cutting capacity, handle options, head shapes, and surface. In our new QSource.com TechCenter article we present a look at "Lindstrom Precision Tools Cutters & Pliers Cutting Capacities & Handle Options." The table featured in this TechCenter article displays the cutting capacity range of all Lindstrom wire cutters, plus, head shapes and surface/handle options for all cutters and pliers. For example, at a glance, you can easily see that the 8141 80-Series Flush Cutters have a small head, oval shape, and flush cutting surface. Each tool listed has easy-to-access information and by clicking on the magnifying glass icon you are brought to that item's page where you can get further details and place your order. Please note: To order non-standard items, such as 80-Series or Supreme Series cutters with ESD-safe handles, please call 800-966-2060 for pricing and lead times. QSource.com offers a full-range of Lindstrom Precision Tools. Our TechCenter article was created to help you make an educated decision before purchasing your tools, but if you require further information, or would like ask about other Lindstrom solutions, please send us an email or give us a call at the number above, and we'll be happy to have one of our experts help you choose the right tool. Don't forget, our TechCenter at QSource.com was built to offer you new product comparisons and other in-depth technical information. We are always open to hearing your suggestions for new TechCenter articles. Shipping your products is simple, right? Just grab a box, fill it up, seal it shut with plastic tape, and send it on its way. Well, have you ever thought what happens to that box on its way to the customer? Does the box look professionally sealed when it arrives at its destination? Does your tape lift off the box allowing it to open? Or even worse, have the contents of the box been tampered with? Those are the kind of questions that will keep a Shipping Manager up all night. We've discovered that one of the most efficient, economical, and easy ways to answer those questions is by using Water-Activated Tape (WAT) and a WAT Dispenser from Better Packages®. Better Packages, Inc. has been creating WAT carton-sealing solutions for almost 95 years. Their WAT technology uses a process whereby when the tape's adhesive is water activated, it penetrates the carton material and forms a permanent bond with the carton. Better Packages' WAT is primarily a combination of Kraft paper and a starch-based adhesive, sometimes containing multiple layers with fiberglass reinforcement. The most cost-effective and efficient way to implement a WAT carton sealing system in your workplace is by using a Better Pack® Electronic Water-Activated Tape Dispenser. According to Better Packages, when using plastic tape packers usually need 2 to 3 strips to seal their cartons, but with WAT one strip creates a secure seal. Better Packages also cites a study that showed it took 16% longer to apply plastic tape with a hand gun versus using an electronic Better Pack machine with water-activated tape. Well, that seals the deal (pun intended), Better Packages' electronic WAT Dispensers will save you time, money, and worries. And with QSource.com's low pricing on these quality machines we're sure it will be an open and shut case (or should we say carton) that you'll find the right model for your needs. Visit the QSource.com Better Packages Department for a variety of WAT Dispensers such as the Better Pack 500 Electronic Water-Activated Tape Dispenser or the 755 Electronic Water-Activated Tape Dispenser. And, as always, if you have any questions about any products on QSource.com please give us a call (800-966-6020) or send an email and we'll be happy to answer them for you. Okay, so June is now halfway over. Have you taken advantage of this month's Social Networking Sale and saved 10% off on your purchase from QSource.com? We have thousands of items on our Web site…and this month you can save 10% off on all of them. And with only two weeks left, don't you think you should start shopping now? Perhaps you need Industrial Furniture…we have almost 150 workbench/workstation solutions. How about upgrading or adding a new Visual Inspection System...browse through a few dozen of those on QSource.com. Or maybe you need a selection of Storage Bins...we have hundreds to choose from. All you have to do is visit the Welcome tab of our Facebook page and "like" us. That simple step will provide you with the code to get the 10% off on EVERYTHING offer for this month's sale and set you up to access future sales. So, don't let June slip away…start shopping and start saving today! When choosing a heating tool, it is imperative that you research all available specifications to ensure adequate temperature range, air velocity, and ease of use. Our latest TechCenter article was created to help you pinpoint the correct Master Appliance Heat Gun/Heat Blower for your application. Master Appliance has been manufacturing quality industrial heating tools for 54 years and their products range from heat guns, butane-powered soldering irons, hot glue guns, and more. In our "Master Appliance Heat Gun/Heat Blower Comparison" TechCenter article we're focusing on their heat guns and heat blowers. Our comparison chart lists air volume, temperature range, type of motor, and more detailed information for 11 styles (comprising 26 different models) of Master Appliance heat guns and blowers. 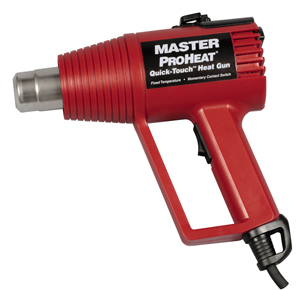 For example, looking at the chart we can see that the Master Heat Gun® has a temperature range of 200°F-300°F, weighs 3.7 lb., and has a universal motor, whereas the ProHeat® Quick-Touch™ Heat Gun has a temperature range of 500°F or 1000°F, weighs 1.6 lb., and has a permanent magnet motor. Each model also has a link to a page with further details, a list of related products, and the ability to add that model to your shopping cart. QSource.com offers hundreds of Master Appliance items, including replacement parts and accessories. If after reading our TechCenter article you require further information, or would like inquire about other Master Appliance heating solutions, please give us a call (800-966-6020) or send an email and we'll make sure we provide you with the proper solution for your heating tool needs. Remember to visit our TechCenter at QSource.com often for new product comparisons and other in-depth information. We'd also love to hear your ideas for new TechCenter articles. Questions About Cleanroom Garment Compliance? Our New TechCenter Article Has Got You Covered! With hundreds of options to choose from, and several different standards classes, it can be confusing selecting the proper cleanroom garments. "Recommended Cleanroom Clothing Standards" is QSource.com's latest TechCenter article, which aims to help you achieve compliance. The article presents a table divided into "aseptic" (free of pathogenic microorganisms) or "non-aseptic" categories. Each category lists what contamination control clothing is required for ISO standards three through eight. For example, for ISO 3, non-aseptic, you must use a hood, hair cover, coverall, intersuit, boots, facial cover, and gloves. 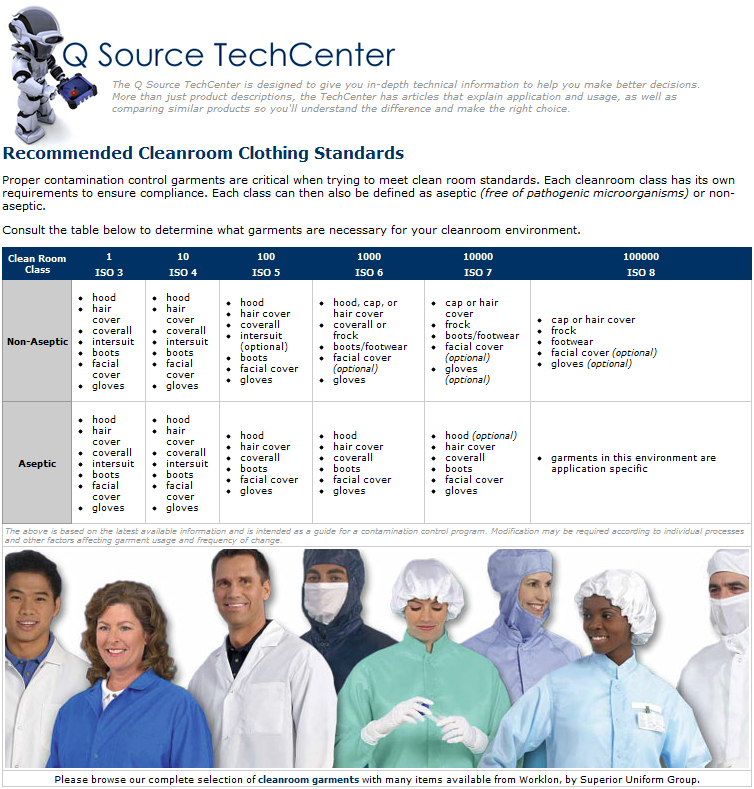 QSource.com's Cleanroom Garments category lists more than 700 items. We currently feature many products from Worklon, by Superior Uniform Group. If you require further information after reviewing our TechCenter article, or browsing our cleanroom garments department, please contact us via phone (800-966-6020) or email and one of our experts will gladly help you. Easily find that specific soldering iron, tip, or rework station in QSource.com's new JBC Tools Department. Our latest department update will help you browse through more than 180 JBC products to locate the exact piece you're looking for. JBC's Tip Cartridges offer fast heat-up, excellent heat transfer, and great durability. Our tips sub-section is arranged by tip series to allow you to go right to the tips you need as quickly as possible. There are more than 150 tip choices in many shapes and sizes such as the C245-903 C245 Series Cartridge, an extended life tip with a conical shape for use with the T245 Handpiece. JBC soldering stations are available in both Premium (created for industrial use) and Compact (same excellent technology in a smaller footprint) models. In the Soldering Stations sub-section you can find direct links to ten quality stations including the CD-1BB Advanced Series Soldering Station. The CD-1BB features a large, high-contrast graphic display and includes a cartridge extractor, an adjustable stand, a cable collector, a brass wool housing, a tip wiper, and a sponge. JBC Tools desoldering stations are also available in both Premium and Compact models. Our Desoldering Stations sub-section currently links to five different selections including the DSS-1A Premium Series ESD-Safe Micro Digital Desoldering Station, which features a large LCD display with a menu that allows the user to easily modify values and settings. Rework Stations from JBC Tools offer innovative features, powerful performance, and dependability. Our sub-section will guide you to a choice of eight Advanced and Premium Series models such as the RMST-1A Advanced Series Rework Station, which excels at rework applications and repairs of through-hole and SMT boards. Our new department was designed to help you locate and easily purchase the exact JBC Tools product solution for your applications. But, if you're not sure of the correct JBC tool for the job, or if you still need further information, please contact us via phone (800-966-6020) or email and we'll have one of our helpful experts suggest the best resources available to you. Have you been waiting to upgrade your existing hand-held portable label printer to the Brady BMP®21? Or perhaps you've been enviously eyeing Brady's versatile BMP®71 from afar. Well, boy, do we have exciting news for you! From now until July 31, 2012, Brady is offering amazing, can't ignore deals on both of these printers. The quick printing, lightweight Brady BMP21 is the perfect labeling tool for your voice/data comm., electrical, and general industrial staff. 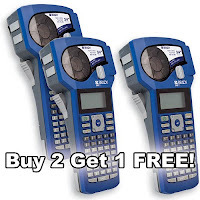 And with Brady's "Buy 2, Get 1 Free" special offer (Brady #: BMP21-3-PACK, Q Source #: B001-005235), it's a no-brainer to stock up or upgrade your existing portable label printers now. For a rugged, but highly versatile, portable printer you can't go wrong with Brady's BMP71. With a built-in QWERTY keyboard, large graphical display, and several incorporated label creation apps, you'll want more than one of these for your workplace. And now, if you buy 1 BMP71, you'll get a second for 50% off (Brady #: BMP71-2-PACK, Q Source: B001-005236)! For further questions about these offers, or Brady products in general, please give us a call (800-966-6020) or send an email and one of our expert sales associates will be happy to help you. 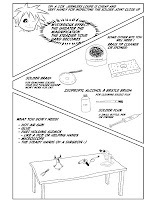 A little over a year ago, we told you about a fun and informative comic book aimed at teaching the reader how to solder ("Soldering Is Easy" - A Comic Book Tutorial for Newbies). 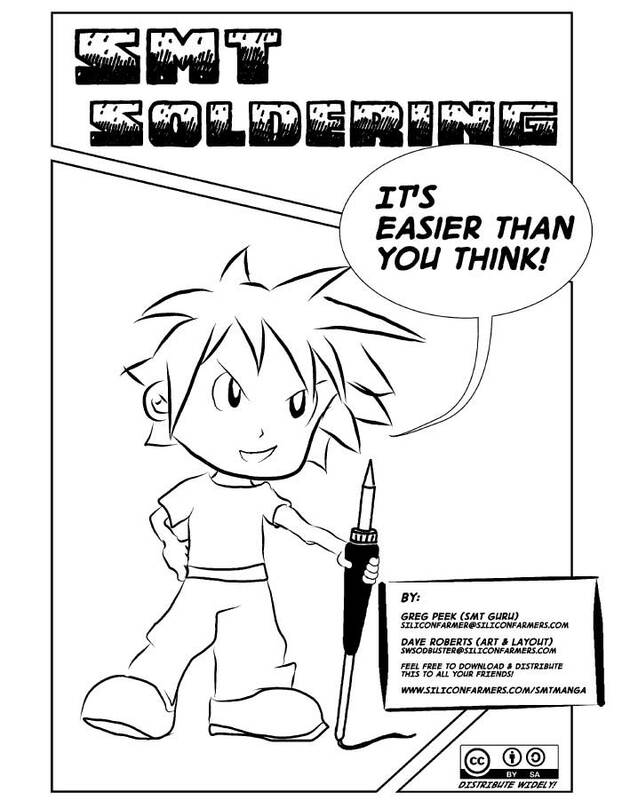 That comic book has now been translated into 15 different languages, downloaded thousands of times, and inspired the latest resource we want to share with you: the "SMT Soldering - It's Easier Than You Think!" comic book. Quincy Botnick (affectionately known as Q-Bot), our resident soldering guru and lovable robot mascot, nearly popped a bolt when he saw this new comic book tutorial. We caught him nodding his metallic head along to each panel in this 18-page graphical SMT (Surface Mount Technology) how-to. Q-Bot really liked how the authors (Greg Peek and Dave Roberts of SiliconFarmers.com) pointed out the best tools and techniques to make most SMT jobs seem quick and easy, while keeping the subject light and adding a comic-book-like sense of humor. We, (especially Q-Bot), highly recommend the FREE "SMT Soldering - It's Easier Than You Think!" comic book. 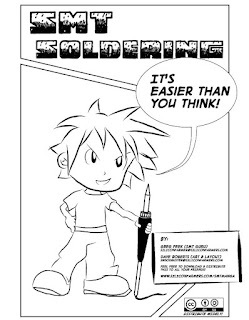 We'd also love to hear about any other soldering resources you come across. Please leave their links and any other related info in the comments section or send us an email. 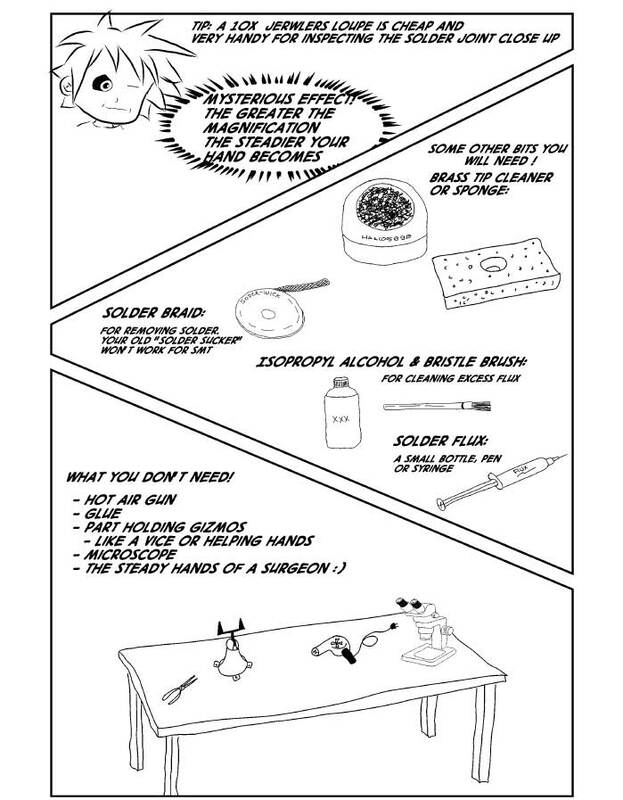 If after reading the SMT Soldering comic book you get to feeling inspired to do a little SMT work of your own, please check out QSource.com for a wide selection of resources to help you on your way. We have a great selection of soldering stations, soldering irons, tips, solder wick, flux, tweezers, magnifying tools, and more. If you can't find what you're looking for, or have further questions, please give us a call (800-966-6020) or send an email and one of our helpful experts will find what you need. Where should you go for the best product info, detailed specs, and low prices on Lindstrom Cutters and Pliers? Why, our new Lindstrom Precision Tools Cutters & Pliers Department, of course! Talk about solution providing! Our newest QSource.com department has been designed to provide all you need to make an educated decision on choosing the right tool for the job. 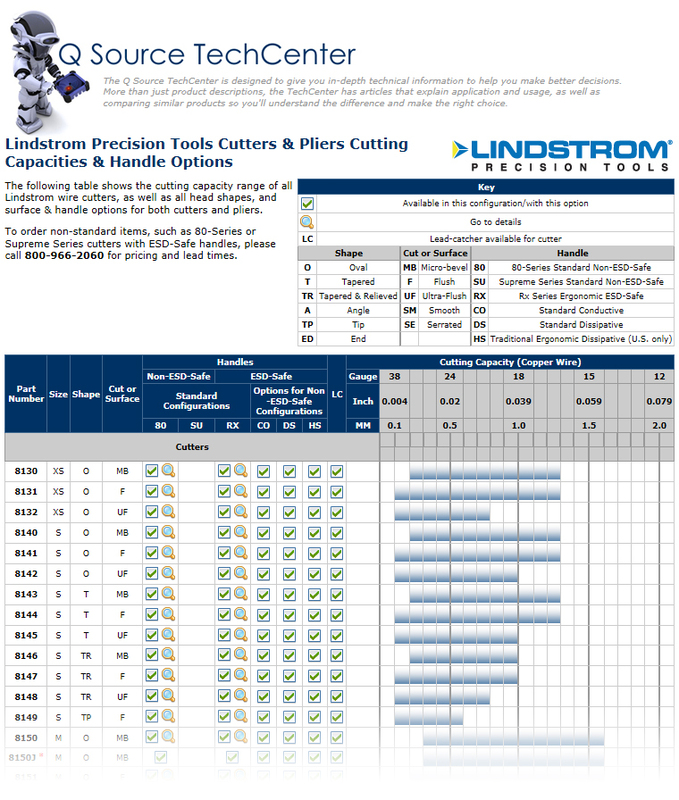 You can quickly access pages of detailed information about Lindstrom's RX Series Cutters & Pliers, the 80-Series Cutters, the Supreme Series Cutters & Pliers, and their EX Series Cutters. That's comprehensive material for more than 75 quality tools! The RX Series is split into two sections. 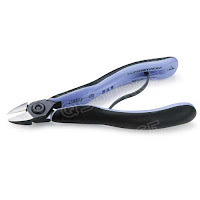 Just click on the cutters or the pliers to go to their respective pages. Lindstrom's RX Series Cutters are ESD-safe and offer the precision work and ergonomic comfort needed for use in a variety of applications including electronics assembly, medical device manufacturing, jewelry/bead work, and more. There's also a convenient link to our "Lindstrom Rx Series Cutter Capacities & Dimensions" TechCenter article where you'll find side-by-side comparisons of dimensions and cutting capacities of the RX Series Wire Cutters. The RX Series Pliers, like the cutters, have benefited from almost 150 years of refinement and technical expertise. They are also the ideal choice for bead, jewelry, and wire bending arts; and for use in medical device manufacturing and electronics assembly. The ESD-safe Lindstrom RX Series Pliers feature 1% carbon/chrome ball bearing-grade steel, forged components, CNC grinding of forged blanks, 63-65 HRC on the cutting edge, a precision screw joint, and a user-adjustable and replaceable BioSpring®. Our Lindstrom 80-Series Cutters section features the cutters that have become the tried and true solutions for many traditional users working with a wide range of wire dimensions and types. The 80 Series Cutters offer unsurpassed cutting capacity and are available in flush, micro-bevel, and ultra-flush cutting types. Our Lindstrom Supreme Series Cutters & Pliers section is also divided into individual pages. Both the Supreme Series Cutters & Pliers are perfect for doing electronics assembly and fine mechanical work. And, on many of the models, a specially made box joint with extra long contact surfaces is available for both types of tools. Because undesirable joint movement is held to a minimum, these tools ensure extremely precise alignment of the jaws, even at the extreme tip. 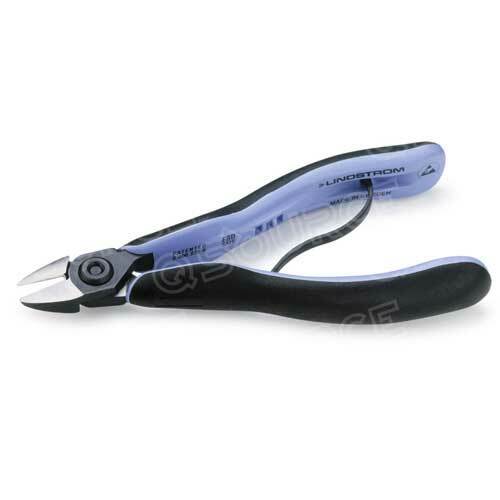 In the Lindstrom EX Series section, we present the Swiss-made cutters that are the superb choice for bead and wire arts or electronics assembly. Featuring wide, ergonomic handles and high-friction grips, these cutters distribute hand pressure evenly and allow precise handling with maximum comfort. Lindstrom's high-chromium steel alloy EX Series are induction hardened and utilize a special screw joint to offer precision alignment and extended tool life. We're sure our new department will help you find the perfect Lindstrom Precision Tool to get your job done. But, if you still have questions before you place your order, you can always contact us via phone (800-966-6020) or email and one of our expert associates will gladly suggest the best possible solution. Save an additional 10% off on everything at QSource.com in our June Social Networking Sale. Everything? Yes, we said EVERYTHING! You can't go wrong taking another 10% off on our already discounted prices on items like Static Shielding Bags, Wipes, and Gloves. And browse through our most popular departments to save even more on great product solutions from Brady, JBC, and Metro. There are so many great items to save on! So, visit our Facebook Welcome page, "like" us, get your June coupon code, and start enjoying 10% off on EVERYTHING at QSource.com.